What if you could avoid the stress, fatigue and overwhelm of the holiday season and make it a time of renewal, regeneration and self-reflection? What if, instead of getting caught up in the hurry and strain, the blues and the blahs, the tawdry displays of excessive commercialism, you could transform the holidays into a time of quiet, magic, awe, and wonder — the way you experienced it as a child? If this sounds inviting, keep reading because I will be giving you 5 Tips to Find Your True-Self during the most holy, sacred time of the year. For many people, this is an important religious holiday, and meant to be a time of worship and celebration of faith, story and song. If that is how you celebrate it, that is a wonderful thing, (but does not exclude your also using the holiday season to renew, regenerate and self-reflect). Astronomically, energetically and spiritually, this season is a time of powerful universal energy that makes it possible to give birth to the true you — your spiritual self. Your spiritual self is actually the main operating system in your life. It guides your mind, emotions and body to make the best choices and decisions for your well-being. It helps you remember that besides your physical self you also possess a powerful mind and a unique purpose. It helps you take better care of your body by remembering that it is the temple of your soul. During this time, there is more peace, love and joy available to us, and yet, so many of us miss this opportunity because we forget the holiness; we forget the magic and miracles that are a natural part of the season. We also forget who we really are, or why we’re really here. Did you know that before the birth of Christ, there were other higher beings and holy masters born in the month of December, or that before Christianity, the Winter Solstice was observed on December 21st to celebrate the Moon giving birth to the Sun (which symbolized longer days and more sun were coming)? The Sun and Moon have deep symbolism both in religious and spiritual aspects. For example, Genesis, the first book of the Bible, tells us that God made the Sun and the Moon as symbols of the power of light to shine through the darkness, as good will shine over evil. The Sun also represents our higher selves. For you, that means it is a unique time when you can birth the spiritual sun within — to see your inner light and fan it’s flame so you can shine more brightly in your own life and in the world. Honoring the holiness of this season with traditions of your faith is important to bringing joy, peace, love , purpose and passion to your life. It’s a candle’s flame that helps to soothe our soul – reducing stress and increasing self-awareness. The soft illumination helps us to calm down and even achieve a meditative state. 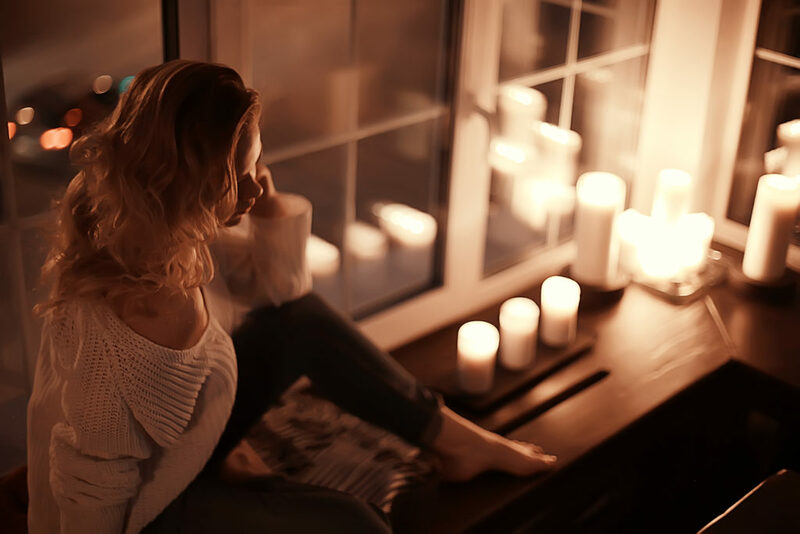 Candles also help you to reflect on your own inner light. We are all essentially made of light — but obscure it in many ways. Realizing you are Light brings you closer to your True-Self. To find your true self, it is necessary to let go of the things that no longer serve you — like negative-thinking, fear, anger, resentment, hate, low self-esteem, needing others to like you, inauthenticity, the past, etc. Light a fire, either in a fireplace or outside in a fire pit, and grab some paper – write a list of what you want to let go of, then throw it into the fire. You will feel lighter in every way. 4. Forgive yourself and others. Perhaps nothing has the power to release your old, inauthentic self and step into your full feminine power as forgiveness of yourself — and others. Take one hour and light a candle, turn your phone and all other technology off. Take some time to reflect on the past year and where you want to grow and thrive in the coming year. Wishing you a season of peace, love, joy and self-renewal. May you continue to uncover your beautiful, loving, true nature with each glorious day of this beautiful season.